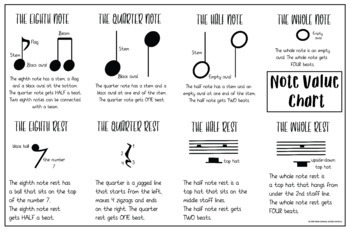 This download is a note value worksheet for first graders who are learning eighth, quarter, half, and whole notes. It is the perfect busy work to give students when you need to leave something with a substitute or just give yourself a short break during class. There are 3 parts with 3-4 questions each. The fourth part is a challenge for your advanced students who finish early. You can have them clap out their challenge for the class when they finish. 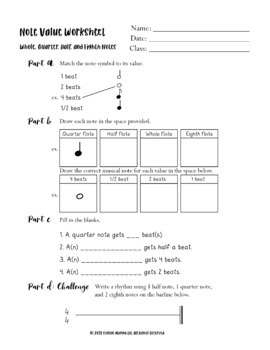 The worksheet comes in .PNG with a WHITE background, .DOCX, and .PDF files. 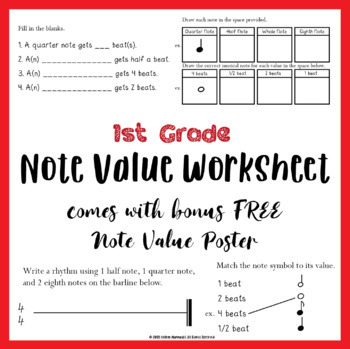 The poster included is from another of my products: https://www.teacherspayteachers.com/Product/Note-Value-Poster-Reference-Guide-to-Musical-Note-Values-4203315 and it comes in .PNG file with a WHITE background. All files are zipped into one folder for ease of download. I hope you and your students will enjoy this product. Don't forget to click "FOLLOW" so you don't miss out on any new products coming your way!